Preheat the oven for 10 minutes on 170 degrees Celsius. Smudge or brush the tin with some fat or oil to avoid the cake sticking during cooking, the tin can be lined with baking paper cut to suit the base of the tin which I did. Place as many peach slices as the base will allow or simply in a decorative pattern of your choice. 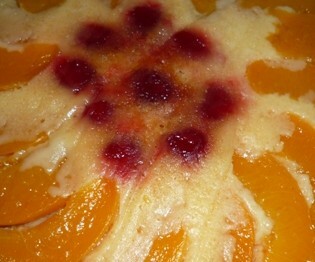 I placed red glace cherries in the centre of my flan to give it some colour ( see picture). Now cream the fat and sugar in a small/medium bowl or jug till soft and creamy roughly for 5 minutes with a handheld electric beater or food processor. Beat the eggs one at a time into this mixture until well mixed. Add the essence and sift and fold in the flour with a spoon without mixing it vigorously but instead gently fold the flour in until all the flour gets mixed into the creamy mixture. From start to finish all of this should take approximately 10 minutes to assemble. Place in the centre of preheated oven and bake for roughly 30 to 4o minutes. Once cooked place a serving plate on top of the cooked flan and turn it up side down to reveal the peaches. 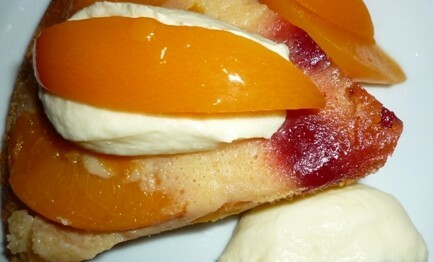 Serve this cut into 6 with a dollop of cream and some more peaches on each plate if preferred. This dish is one of my recipes learnt from my mum-in-law during my early years of marriage. I used to bake this recipe often when my sons were little because it was quick and easy and also pineapple rings dotted with glace cherries were our favourite and the combination was delightful. Also pineapples rather reminded me of my home in Malaysia where we grew them ourselves. Recipes like these are so easy and simple and by adding your own flair to it you can easily make a good dish when having guests over but you don’t have time to cook any extravagant dessert recipe. The sponge base of this recipe remains moist but not too spongy either. Apricot, pear and fruit of your choice can also be an alternative.